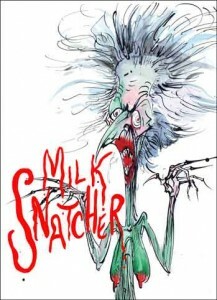 Gerald Scarfe’s satirical depictions of Margaret Thatcher span a 22 year period and illustrate the turbulent career of one of the most significant and controversial political figures of recent times. These illustrations chart the Iron Lady’s time as a member of the shadow cabinet, her leadership of the Conservative Party, her tenure as Prime Minister, and, ultimately, her political decline. The cartoons are vivid reminders of the miners’ strike, the Falklands War and the close relations Margaret Thatcher struck up with the USA. The exhibition is touring from the Bowes Museum in County Durham. Where to see a Scarfe? 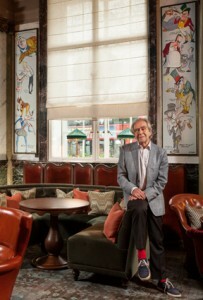 Gerald regularly updates his work on display at Scarfes Bar at the Rosewood, London. The prints are changed to reflect the latest news, and even original work is changed from time to time. 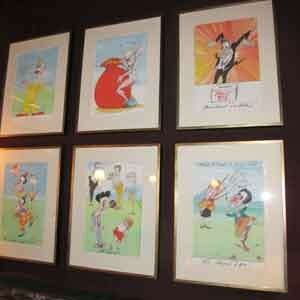 So drop in for a drink to this splendid bar and keep up to date with Gerald Scarfe’s work at the same time. 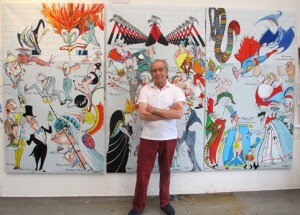 Gerald Scarfe auction lot raises £3,000! The first edition copy of The Making of Pink Floyd The Wall with additional annotations and drawings by Gerald Scarfe raised £3,000 in the Sotheby’s auction on 8th December, with all funds raised from the auction going towards House of Illustration. AMAZING AUCTION LOT – FIRST EDITION OF PINK FLOYD THE WALL! GERALD SCARFE – THE MAKING OF PINK FLOYD THE WALL. AUCTION OF FIRST EDITION WITH NUMEROUS ANNOTATIONS AND ILLUSTRATIONS INSERTED AND ADDED BY SCARFE. On Monday 8th December Gerald Scarfe is taking part in a fundraising auction, First Editions: Redrawn, in partnership with Sotheby’s is being held. All the funds raised from the auction – Sotheby’s has very generously waived all sale commission – will go to support House of Illustration. They moved into their new home this summer, and the artistic and educational potential of the new space is even more exciting than predicted, but they need funding to fulfil its potential. For any fans of Pink Floyd The Wall this auction lot is a ‘must have’ item. First Editions: Redrawn will be a unique auction of re-illustrated and annotated first editions from some of the world’s greatest living illustrators. Thirty-four acclaimed illustrators – and some authors – have returned to one of their classic books, adding extra illustrations, comments on existing drawings and personal insights about the motivation behind characters. This has resulted in 38 unique lots – the definitive, never to be repeated, editions of 38 timeless classics. The auction will be held at Sotheby’s, 34-35 New Bond Street, London W1A 2AA on Monday 8 December at 7.30pm (doors open at 7.15pm). Scarfes Bar at the Rosewood London now open! Scarfes Bar at the Rosewood London, filled with Gerald Scarfes’ specially commissioned canvases, had its official opening event on Monday 7th April. The bar is great – and the work looks wonderful! 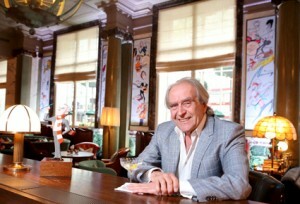 The recently opened hotel on High Holborn in London, The Rosewood London, has honoured Gerald Scarfe by naming their bar after him. (They asked that the apostrophe be left out!). And they asked Gerald to create a number of wonderful canvases which will permanently adorn the walls there. The 11 canvases depict many aspects of British life including politicians, celebrities and Royalty, and the exhibition of his work includes three larger canvases (shown in our picture) covering ‘Scarfe’s World’ where Gerald has re-created some of his well-known drawings from the past. So if you are in the area call in for a drink and a look at these beautiful paintings. An auction of dozens of decorated fibre glass models of animation character Gromit the dog, the long-suffering canine companion of the cheese-loving inventor Wallace, including one by Gerald Scarfe entitled Watch Out Gromit!, has raised more than £2m for Bristol Children’s Hospital. 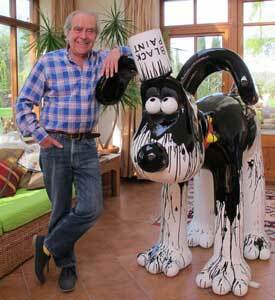 Gerald Scarfe’s dog raised a wonderful £50,000. 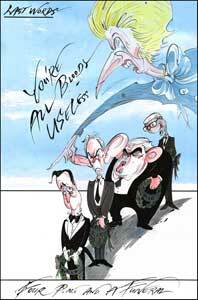 Gerald Scarfe’s cartoon for the Sunday Times, published the weekend before her funeral, seemed to strike a chord and has proved his most popular for some time with both the public and media, with many requests for its use, as well as our best first week sales for prints. Gerald’s iconic drawing of Margaret Thatcher as the ‘Torydactyl’ inspired David Martill, a Portsmouth University palaeontologist, to name the newly discovered cousin of the pterodactyl after him. 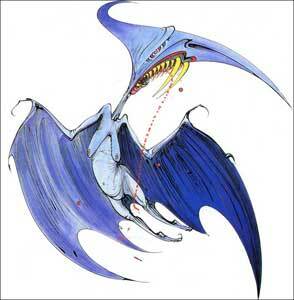 The new pterosaur species has been called Cuspicephalus scarfi, because the fossil’s unusually pointy head reminded Dr Martill of the cartoon.